Reorganization Plan No. 3 (35 FR 15623, 84 Stat. 2086) was an executive order submitted to the United States Congress on July 9, 1970 by President Richard Nixon establishing the Environmental Protection Agency (EPA) and setting forth the components of the National Oceanic and Atmospheric Administration (NOAA). The order consolidated components from different Federal agencies to form the EPA, "a strong, independent agency" that would establish and enforce federal environmental protection laws. Unlike other agencies such as OSHA, the EPA was not established by a single enabling act of Congress. According to author Jack Lewis, the decade of the 1960s fostered a general consensus of the American public to increase protection and betterment of the environment. Rachel Carson published Silent Spring in 1962, which is widely credited with helping to launch the environmental movement. On January 28, 1969, eight days after Richard Nixon became the 37th President, a blowout on the ocean bottom near Union Oil's Platform "A" on the Dos Cuadras field leaked between 80,000 and 100,000 barrels (16,000 m3) of oil into the water of the Santa Barbara Channel, near Santa Barbara, California. The oil spill polluted a 60-mile stretch of coastline, harming marine wildlife and damaging the local fishing economy. The event led to widespread criticism of both Union Oil and the offshore oil drilling industry. On April 22, 1970, the first Earth Day brought millions of Americans together to peacefully demonstrate in support of environmental reform. In April 1969, President Richard Nixon addressed these environmental concerns by establishing the Environmental Quality Council in his cabinet, along with the complementary Citizens' Advisory Committee on Environmental Quality. In December of the same year, Nixon received the National Environmental Policy Act (NEPA) from Congress, a bill that Congress stated was intended to "create and maintain conditions under which man and nature can exist in productive harmony" and to "assure for all Americans safe, healthful, productive, esthetically and culturally pleasing surroundings." The NEPA required any federal agency planning a project that would affect the environment to submit a report on the likely consequences of its plan. President Nixon signed the NEPA on New Year's Day 1970, declaring "that the 1970s absolutely must be the years when America pays its debt to the past by reclaiming the purity of its air, its waters, and our living environment." Pub.L. 89–554, 80 Stat. 378, enacted September 6, 1966, created Title 5 of the United States Code (Government Organization and Employees), which was the legal authority under which the Reorganization Plan was authorized. Logo of the US Environmental Protection Agency (EPA). Reorganization Plan No. 3 was prepared by President Nixon and sent to the Senate and House of Representatives on July 9, 1970, in accordance with the provisions of chapter 9 of title 5 of the United States Code. The plan was originally approved under special Congressional procedures but its legality was called into question due to the Supreme Court's decision in Immigration and Naturalization Service v. Chadha, 462 U.S. 919 (1983). Congress responded by enacting the Reorganization Acts Amendment in Public Law 98-614, which was signed on November 8, 1984. The Amendment expanded the power of the President to communicate with Congress plans of reorganization of agencies within the executive branch. In his message to Congress explaining his reasons for proposing Reorganization Plan No. 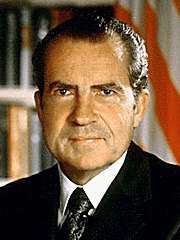 3, President Nixon stated that the national government was "not structured to make a coordinated attack on the pollutants which debase the air we breathe, the water we drink, and the land that grows our food." According to Nixon, the assigned duties and responsibilities regarding pollution control for the environment were spread out among many discrete departments, creating a structure that often defied "effective and concerted action." To create more of an interrelated and effective system for dealing with environmental pollution, he proposed "pulling together into one agency a variety of research, monitoring, standard-setting and enforcement activities now scattered through several departments and agencies." Under the terms of Reorganization Plan No. 3, the Environmental Protection Agency would be created to absorb these departments and agencies. From the Department of the Interior, functions carried out by the Federal Water Quality Administration as well as pesticide studies would be moved to the EPA. From the Department of Health, Education, and Welfare, all or some duties of the National Air Pollution Control Administration, Bureau of Solid Waste Management, Bureau of Water Hygiene, Bureau of Radiological Health of the Environmental Control Administration, and certain functions with respect to pesticides carried out by the Food and Drug Administration would be moved to the EPA. From the Department of Agriculture, the responsibilities of the Agricultural Research Service to register pesticides would be transferred. The new agency would also absorb the authority of the Council on Environmental Quality to perform studies on ecological systems and the duties of the Atomic Energy Commission and the Federal Radiation Council regarding radiation criteria and standards. On December 16, 1976, the first Administrator of the EPA, William Ruckelshaus, declared that the agency had "a broad responsibility for research, standard-setting, monitoring and enforcement with regard to five environmental hazards; air and water pollution, solid waste disposal, radiation, and pesticides." In Reorganization Plan No. 3, President Nixon outlined the following as the roles and functions of the EPA: establishing and enforcing environmental protection standards consistent with national environmental goals; conducting research on the adverse effects of pollution and on methods and equipment for controlling it, the gathering of information on pollution, and the use of this information in strengthening environmental protection programs and recommending policy changes; assisting others, through grants, technical assistance and other means in arresting pollution of the environment; and assisting the Council on Environmental Quality in developing and recommending to the President new policies for the protection of the environment. 1 2 3 Lewis, Jack (November 1985). "The Birth of EPA". EPA Journal. U.S. Environmental Protection Agency. Retrieved October 11, 2008. ↑ Josie Glausiusz. (2007), "Better Planet: Can A Maligned Pesticide Save Lives?" Discover Magazine, p. 34. ↑ Nedelkoff, Robert (June 14, 2010). "RN and the Formation of the EPA". Domestic Policy. Richard Nixon Foundation. Retrieved November 10, 2010. 1 2 3 4 "An Environmental Revolution", U.S. Environmental Protection Agency, accessed November 3, 2010. ↑ "Nuclear Regulatory Legislation", Office of the General Counsel, U.S. Nuclear Regulatory Commission, May 2009, accessed November 10, 2010. ↑ Library of Congress, Thomas. "Major Congressional Actions". H.R. 1314 Reorganization Act Amendments of 1984. Retrieved 21 January 2012. 1 2 3 4 5 "Reorganization Plan No. 3 of 1970", U.S. Environmental Protection Agency, July 9, 1970, accessed October 31, 2010. ↑ Ruckelshaus, William (December 16, 1970). "First Administrator on establishment of EPA". EPA press release. U.S. Environmental Protection Agency. Retrieved October 31, 2010.